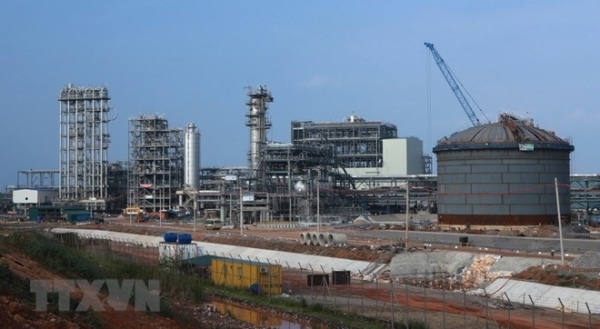 The Nghi Son refinery plant in the Nghi Son Economic Zone of the central province of Thanh Hoa, is expected to contribute about 8 trillion VND (342.6 million USD) to the State budget in 2018. After six months of operation, the plant produced 12 types of products, meeting the technical standards for domestic consumption and export. The products of Nghi Son Refinery have been supplied to the market, including RON 92, RON 95, jet fuel, benzene, polypropylene, diesel, sulfur, and others. Earnings from the plant’s exports reached 204 million USD in the period. Nguyen Van Thi, head of the management board of Nghi Son Economic Zone and Thanh Hoa industrial parks, said the plant will be officially put into commercial operation with a designed capacity of 10 million tonnes of crude oil/year (or 200 barrels of crude oil/day) from November 15. The plant’s products are expected to meet 40 percent of domestic demand, contributing to ensuring national energy security, creating incentives for attracting investment to the industry and service, especially supporting industry for the oil refinery sector. The Nghi Son project has a total investment capital of over 9 billion USD. It is invested by a consortium of Kuwait International Petrochemical Company (KPC, 35.1 percent), and the Japanese firms Idemitsui Kosan (IKC, 35.1 percent) and Mitsui Chemicals (MCI, 4.7 percent). The rest is contributed by the state-run Vietnam Oil and Gas Group (PetroVietnam). In the coming time, the KPC will invest over 5 billion USD to extend the project and build a crude stockpile as well as other important projects in Thanh Hoa.